3 Ways To Make The Most Of Spare Tiles! If you’re someone who loves to get involved in arts & crafts activities, you’ve probably got an interest in creating wonderful mosaic or tiling designs with the help of some spare tiles that often go unused. It’s always recommended that you look to get hold of a few spare tiles before a tiling job, as you may require replacements due to damage or you might be unaware of the exact measurements. So if you do have some left over, here are three other uses of natural stone tiles that we’ve come across in the past that are great for those with a creative mind! If you’re looking to put a smart tabletop somewhere in your home, such as in the hallway or possibly even the front room, you can improve its interior design potential by decorating the surface with coloured stone tiles. Simply apply your preferred paint to the stone tiles, whether they’re still intact or not, and decorate your tabletop with them! You can create a stunning piece of jewellery with the help of some spare stone tiles as well. Start by cutting your preferred shape from the tile you have left over and proceed to decorate however way you like! Once you’ve got hold of the finished article, place a hole in the top centre area of the tile so it can be sued with a chain. Are you having trouble with tea or drink stains as a result of having no coasters? Stone tiles are perfect for placing drinks on, especially hot drinks such as tea or coffee. Place a thin, fabric material underneath the tile to act as the surface of your coaster and proceed to decorate the top as you see fit. 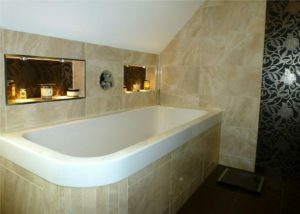 Posted in Interior Design, Limestone, Make Your Own, Tiles Leave a Comment on 3 Ways To Make The Most Of Spare Tiles! We’re all after that luxurious finish when it comes to tiling, whether it’s a contemporary home or something a little more antique. However, achieving luxury in a contemporary home can be quite tough, especially with so much to compete with in the market. Here are a few luxury stone flooring ideas that might give your contemporary kitchen or bathroom the sparkle it needs to reach new heights. Glamour and contemporary go hand-in-hand, so going for something that dazzles or sparkles could work particularly well. Once the mirror effect of your shiny stone tile attracts the natural light of your bathroom, it creates a shimmering atmosphere that compliments any modern bathroom design. Urban chic is really growing in popularity. The slate flooring effect means that bathrooms and kitchens are now adopting a unique design that compliments the idea of natural stone. With the addition of some exposed brickwork and wooden cabinets or furnishings, you could create a beautifully luxurious urban environment in your bathroom without substantial expenditure. The Scandinavian effect incorporates plenty of wooden features as well as cubic furnishings and no short amount of natural light. With the addition of some naturals tone tiles, you can create a spa-like atmosphere that lives up to the demands of luxurious contemporary bathrooms. A touch of the outdoors, such as plant life, shells or stones will also work really well here. For more information on our wide range of slate tiles and more, get in touch with us today and we’ll take you through our unrivalled collection of natural stone. How Does Natural Stone Get Its Colour? We’re lucky enough to work in an industry here at the Stone Tile Emporium that provides us with all kinds of questions regarding the origin of natural stone and its characteristics. It’s fascinating to learn more about the origin of natural stone, especially when you consider that the majority of stone flooring is the result of millions of years of compression beneath the earth’s surface. For example, the colour in natural stone tiles derives from all kinds of organic matter and minerals. So how exactly does natural stone get its distinct colour and pattern variations? The colour of natural stone is dependent on the minerals and organic matter present. For instance, red marble is given its colour from a high presence of iron, whilst green marble gets its colour from serpentine. You can easily identify various minerals in natural stone by carrying out some research on the specific colours you get from all the different minerals present in stone. This can help you locate the perfect colour for your interior design plan. So what should you know about minerals in order to maintain a tiles natural look? There are some stone tiles that gradually fade over time when exposed to sunlight, such as marble tiling. Marble is sensitive to ultraviolet light and will subsequently lose its deep, shiny dark colour over time. You can bring the colour back by polishing or honing the stone every now and then. Posted in Interior Design, Stone Tiles, Tiles Leave a Comment on How Does Natural Stone Get Its Colour? Stone cladding doesn’t just exist to provide the exterior parts of a property with a fresh, attractive design feature. In fact, there are a number of reasons why stone cladding could be the answer to your natural stone tiles dilemma. Stone cladding provides a natural answer to weatherproofing and ventilation as the extra layers cope with ever-changing temperatures and the threat of damp, especially during the winter. Cladding is a low cost alternative to other methods of changing the appearance of your property. If you’re going through a decorative change, stone cladding is a cost-effective, hygienic and attractive way of instantly updating your properties appearance. Cladding is also used in interior design with kitchens, bathrooms and other domestic walls benefiting from the natural feel associated with stone cladding. It’s a worthy alternative to tiling and gives you a little bit more of a natural, eco-friendly atmosphere. Many people who carry out barn or garage conversion struggle to negate the “bolted on” effect, especially when they are changing the style of an outbuilding completely. Stone cladding lets you maintain that continuity with existing walls. Stone cladding disguises any solid wall insulation you might be using. Solid wall insulation could save you a huge amount of money on your fuel bills and you can maintain the appearance of the outside of your property by disguising it with stone cladding. Christmas is on its way so you might be planning to treat yourself with brand new tiles for your bathroom or kitchen and have your home looking great in preparation for the big day. If you find yourself in the market for some new tiles or feel you might struggle with the wide variety of textures, styles, themes and materials on offer, here’s a few handy tips to consider before investing in your festive stone tiles. Firstly, consider where the tiles are going to be placed and how their texture, colour and style will affect the look of the space. For example, lighter tiles would be ideal for a space that needs to look bigger due to its size and you might need a specific texture if your style preferences are particularly detailed. Slate provides an excellent natural texture that works wonders for your bathroom, whilst the dark, sleek design of marble tiling can really work in a more contemporary kitchen space. It’s also important to consider the durability of your tiles. Are they capable of lasting a considerably long time without getting damaged? Can they withstand cleaning products for the foreseeable future? Ultimately, the life of a tile can be daunting depending on where it’s situated but it’s worth considering this important factor when purchasing nonetheless. Finally, try and have a long term bathroom plan in mind when buying your tiles. How are your style preferences going to change in the next few years? What sort of bathroom appliances will you be investing in? It’s a good idea to look at some kitchen and bathroom design ideas beforehand so that you can see where your new tiles are likely to lead you. Don’t forgot to visit the Stone Tile Emporium for an introduction into the wide range of tiling ideas we have to offer! We’re set for some great weather in the coming days, so there’s never been a better time to carry out some outdoor DIY. If you’ve always dreamt of relaxing outdoors during the summer whilst reading the paper or enjoying a cold drink, you might benefit from a new patio area. Natural stone tiles are ideal for any new patio, with all kinds of designs available to suit your preferences. Here are a few tips from us at the Stone Tile Emporium on how to create the perfect garden patio. Remember that not all tiles are the perfect fit for a garden patio, so it’s important to make sure you choose the right natural stone that’s capable of coping with harsh weather and rainwater. You also need to be aware of how some outdoor patio tiles can easily absorb water and cause cracks during the winter. Therefore, a good choice of material would be porcelain, as it does not absorb water particularly fast. For strength, granite tiles are a great choice as they are particularly sturdy and won’t get damaged in stormy weather. Naturals tone to avoid would be something like slate, which is softer than granite and may not be able to cope with mixed weather conditions over a long period of time. When it comes to decorating your new patio, you should try and incorporate as much of the natural beauty of your garden as possible, whether its potted plants or accessories like rocks and shells. You could also create a canopy of foliage to cover an outdoor dining area. Depending on how big a part you want your new patio to play, you can introduce a whole host of great features, including an outdoor fireplace or perhaps some artificial lighting. Just remember that design trends don’t stick around for long, so keeping to your own preferences is always the best way to go. It’s about time we looked at some of the outstanding bathroom interior design ideas that are currently doing the rounds, especially as a lot of the natural stone tiles that we supply contribute significantly to the style of a bathroom, whether it’s something contemporary or a classic period design. Here are three wonderful bathroom interior design ideas that make the most of natural stone, from marble to mosaics. I bet you never thought you’d take a subway-style tiling method and place it in your bathroom? It seems to work really well in this case however, with glistening rectangular, uniquely regimented tiles providing the backdrop to a beautiful marble bathtub, alongside wooden storage compartments and antique-style tabletops. A bathroom fireplace doesn’t only provide you with added warmth; it also acts as a wonderful interior design feature. This classic element works wonderfully with hexagonal mosaic tiles on the floor, alongside a classic bathtub with period features and lighting effects throughout. Laminate wooden flooring, sleek windows and a rectangular shape consistent throughout the room are all associated with contemporary bathrooms; yet throwing in a stunning Romanesque marble bathtub and vintage appliances seems to work wonders. Natural lighting is supplied by large windowed balcony doors. If you’ve recently installed a new patio in time for the summer, you might have to soon put up with weeds attempting to surface through the small gaps often created between stone tiling. In fact, weeds are actually a year-round issue that can gradually get worse if you don’t deal with them. If you don’t fancy the idea of taking up your natural stone tiling again to cope with the problem, here are a few tips for using standard weed killers to get the maximum effect! The best time to apply any weed killing solution that you purchase is in the spring, which is when the vast majority of weeds are already at the largest and there are little to no seeds on the surface. If you’re in the middle of summer already, you can still apply weed killing solutions to get rid of weeds, but it may not prevent them from coming back. Rain is great for helping plants grow and weeds rely on them as much as any other species. However, rain is also capable of washing away any weed killing solution you’ve applied within a few hours, so choose a dry, warm day to use weed killers. Weed killers attack the top half of growth, so digging around might actually stop the process from working effectively. Whilst you might feel like tearing weeds out of the ground every time they appear, it’s much better to let weed killers do their thing. Follow these guidelines and you’re certain to have weed-free natural stone patio ready for the summer in no time! We’ve all experienced the ups and downs of carrying out DIY work and installing new stone flooring or wall tiling is probably one of the most common DIY jobs that you’ll come across. There are always questions that need answering when tiling, so we’ve decided to put together a few FAQ’s for those of you who are seeking out some helpful tiling advice or information. Three questions will be answered each week, so keep an eye on our blog over the coming weeks! Q. Is it safe to drill through my bathroom tile installation? A. Yes. However, it all comes down to what your tiles are made from. If they are thin and ceramic, a cheap drill bit is all you need to carry out the job. Porcelain tiles on the other hand require small diamond drill bits and can be much more difficult to start. Q. Can tiles stick to plywood? A. Plywood is quite a common bathroom material, though it must be thick enough to not be affected by regular changes in temperature. You will need a latex based bonding solution rather than standard PVA solutions to get tiles to stick to Plywood. Q. Do I have to seal my natural stone tiling? A. Yes. Natural stone isn’t porous so you’ll have to carry out a grouting procedure. Once the grout has been left to dry, it should become waterproof. Grouting doesn’t have a significant effect on the look of your natural stone tiles, so don’t worry too much about this. – Loosen the grout around the edges of the damaged tile using a grout remover. Once you’ve done this you can start to rake out the rest of the grout. – Drilling holes into the central areas of the tile helps to weaken the surface, so use a small ceramic drill bit and drill four holes in a square shape into the tile. You can increase the size of the ceramic drill bit if necessary. – Equip yourself with a hammer and chisel and gradually chip away at the central space between the holes you’ve made. This gets rid of the central part of the tile, although you should be careful not to scratch the wall beneath it. – From here, use the chisel to get underneath the rest of the tile, moving towards the edges until you’ve removed it entirely. This is where you need to be careful not to damage the surrounding tiles. Try and get rid of much of the adhesive as possible as well. – Check that your replacement tile fits neatly into the new gap and that the adhesive isn’t pushing the tile further out in comparison to the others. Put new adhesive on the replacement tile and position it in the space. – Use a flat piece of wood with that is larger in length to the tile to push it into place. Fit new tiles spaces so you can fill in the edges with grout. It’s important to wait for the adhesive to dry before doing this.